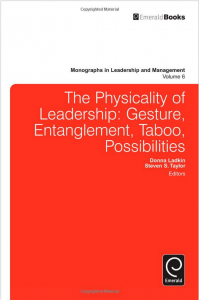 In this bookchapter, which I wrote together with Ian Sutherland from IEDC Business School, we describe our experience of using dance and choral conduction to teach managers at an executive MBA course about leadership. It is no surprise that artists rely closely on their senses to create, develop, and perform their art. Musicians rely on what they hear, dancers rely on their proprioceptive sense and sense of movement, and painters rely on their vision. They rely on these senses to make decisions during creation and performance. At the same time their art can be seen as an exploration of what humans can experience through the senses. Developing the capacity to sense is an integral part of art education that is valued as highly as learning technical skills, such as, the musicians mastery of the instrument, the dancers mastery of the body, and the painters mastery of color and brush techniques. In management education, things are different. Relevant techniques are taught, but no special attention is given to developing the ability to sense. There is an implied assumption that managers already know how to do this. However, on a two day MBA course, it became clear that not only is this not the case, but moreover the traditional pedagogical formats used actively limit the ability to sense. The result is leaders who know technique for enacting leadership, but, due to their underdeveloped ability to sense, are unable to apply these techniques appropriately in practical settings.